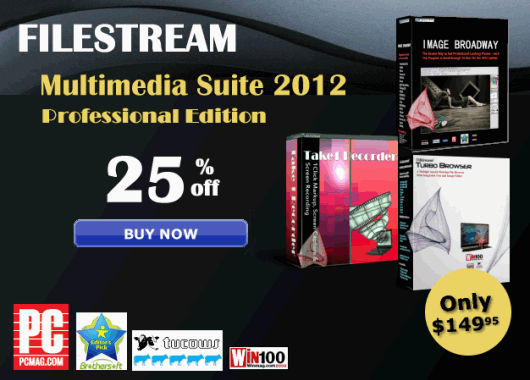 FileStream Multimedia Suite 2012 Professional Edition consists of three award winning, powerful yet easy-to-use multimedia programs: Image Broadway, Turbo Browser, and Take-1 Recorder. Upgrade Offer: Registered users of any of the component software in the full Suite are qualified to purchase the full Professional Suite at the reduced upgrade price of $59.95. For example, if you are a registered user of Image Broadway, you may purchase the full Suite at the upgrade price. By merging together the new easy-to-use layout with the already impressive core technology of Image Broadway — the new Image Broadway 5 is born! It’s easier to create professional graphics and edit digital photos. Hailed by critics, it’s the new hot program for the upcoming year. Speed Image Broadway offers you better performance compared to others. It starts up faster, it finds, opens, and imports images faster, it fixes and refines photos faster, and it saves and prints faster. The Darkroom is entirely intuitive. You don't need to take a course to be able to edit your photos. Now, with a drag of your mouse you can pull and slide bars to adjust backlighting, fill flash, brightness, and contrast of your photos and watch the changes on your screen instantly. On Screen Photo Editing - The award winning Turbo Bowser offers you many essential quick fix photo editing tools from single click red eye removal button, auto-fix buttons, color adjustment, white balance, fill flash, back lighting, and color cast removal sliders along with the original shooting information and histogram. This new release lets you batch convert, optimize, resize, reduce file size, and print one or groups of photos and images. Organize and Create DVD/CD - The Organize Wizard lets you organize your photos by name, event, time, or location. Most digital cameras list your photos with serial number style names, which is very hard, if not impossible, to figure out which photo is which. With the additional tools like zip, unzip, and publish , you can organize photos on your hard drives and network fast and easy. Burn them onto DVD/CD with Verify to secure backup protection. You can also create your own Slideshow with just a couple clicks. FileStream® Take-1® Recorder lets you create How-To videos or capture anything that you see (and hear) from your screen, like YouTube, with just one click or keystroke. Take-1 Recorder lets you capture an entire Webpage and save it as an image. It captures the full page, on screen and off screen. It also lets you capture windows by captions - including those partially visible or hidden, from your screen with one click or keystroke. Take-1 Recorder also comes with built-in onscreen markup tools so you can capture, record, and mark it up all in one place.